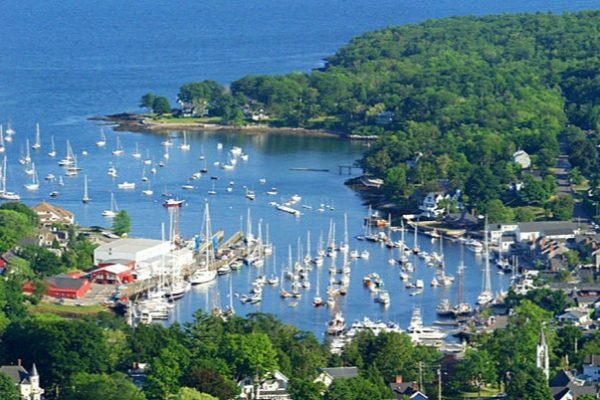 An aerial view of Camden, Maine. Camden recently became the first Maine town to join nearly 7,500 cities and towns from around the world in committing to an agreement that aims to combat climate change at a local level. But unlike in the thousands of other municipalities that signed on to join the Global Covenant of Mayors for Climate and Energy, local high students are the ones who have conducted the groundwork research for Camden by taking inventory of greenhouse gas emissions. Ten students from the Watershed School, an independent high school in Camden, took six weeks this spring to collect data on building, transportation and other sources of emissions produced in Camden so the town can then set goals on how to reduce these emissions. “It’s really important for us at this age, to not just be informed about [climate change] but to take action with it, so we know in the future what to do, and what to tell the next generation to do,” Watershed student Maura Carpenter said. The Global Covenant of Mayors for Climate and Energy is an international alliance of local governments that have agreed to assess their contributions to climate change, form strategies and an action plan to reduce emissions at the local level, and then report back to the covenant on progress. In March, Camden officials agreed to commit to the alliance, but only if students could help with the first step of taking inventory of Camden’s emissions. So, they turned to the students of Watershed’s global climate change class. Each year, students of this class take on an end-of-year research project that explores climate change. While students typically pick the project, collecting data that would help move Camden forward jived with Watershed’s school philosophy. “Part of the philosophy of the school is to be involved with the community and to do things that are relevant.” Janet McMahon, the class’s instructor, said. The Watershed School is the first group of students involved with Global Covenant of Mayors for Climate and Energy municipalites to conduct the greenhouse gas inventory required for moving forward, McMahon said. To compile the greenhouse gas inventory, students tabulated the energy use from residential and commercial buildings, transportation, waste treatment and disposal, and the production of drinking water. At points, gathering all the data required from town officials and energy providers seemed daunting, McMahon said. But the students persisted. Based on the preliminary findings, Camden’s residential energy use is the largest contributor to the town’s emissions, with transportation being second largest. With 40 percent of Camden’s homes being more than 70 years old, students pointed out that leaky and fuel-inefficient homes are likely causing emissions to be high. “That really shows where our focus should be as a town, is on really trying to bring down that [residential] oil use,” Alex Facq said. Going forward, the data collected by students will be given to Camden’s Energy and Sustainability Committee. The inventory will have to be completed by the committee, because students were not able to get all of the information they needed from the town. While ultimately, it will be town officials who are responsible for setting emission reduction goals and putting in place strategies to meet them, Watershed students hope the school will be involved going forward.